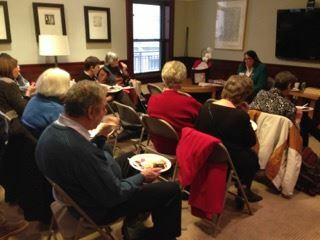 During a unique program on Jan. 21 called “Food Finds,” author Peggy Engel told the stories of vendors of specialty mail order foods from around the country. Village members got to taste a plate full of goodies, including O&H Cherry Kringle, “weird” Idaho candy bars, Molinari salame and Red Pelican mustard from Detroit. A room full of Villagers braved a mild snowfall to hear Peggy’s stories about specialty foods from their own home states and towns as part of the question and answer discussion. Members Madelyn Evans and Wendy Pallet were winners in the raffle for copies of Peggy’s book, "Food Finds: America's Best Local Foods and the People Who Produce Them." The group also included two of our newest members – which now number 140. There’s nothing like exotic nibbles to foster good conversation and build community!